There are not many nights where Seward County Head Coach Bryan Zollinger comes out of his locker room after a losing effort and still sings the praises of his team. Mark November 21, 2015 down, because it was one of those times. Following an epic wire to wire battle with a talented Midland team, Zollinger’s Saints came up just short Saturday night, falling 93-89 for their first loss of the season in a contest that had emotions flowing high from the opening tip. 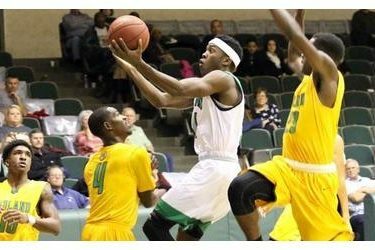 With a few off the court incidents between the two teams preceding the game, fuel was added to the fire in what was already set to be a classic top tier NJCAA matchup between 8-0 Seward County and 7-1 Midland. The Chaparrals got off to a good start, running out to a 7-2 and then 10-4 lead on the Saints but five straight points from Charles Beauregard got Seward back in it, making it a one point game seven minutes in. Moments later, the Saints took their first lead of the night on a three pointer from Delano Jones, but quickly Midland recovered and took the lead back 22-20 with 7:38 to go in the half. Matthew Lewis again provided a spark off the Seward bench on the first possession after entering to tie the game up and Marcus Mathieu connected from downtown to make it a 25-22 game in favor of Seward. It continued to be a back and forth tussle to 29-29 when a 10-2 Chap run opened up Midland’s biggest lead to that point of the game at 39-31. The Saints didn’t let the Midland cushion get any larger though and hung around through the final minutes of the half before a Chaparral tip in in the final seconds gave Midland a 54-47 lead at the break. Somehow the Saints were able to keep things close in the first half despite the Chaparrals out-shooting them 53% to 39% in the first 20 minutes of action. As expected, the much bigger front line of Midland held a plus 10 lead in points in the paint in the first period 28-18. The teams traded baskets early in the second half to 62-55 when a quick 4-0 Midland run gave the Chaps a double digit advantage 66-55 with 15:22 remaining. A big basket from Beauregard out of a Saints timeout got Seward back to single digits and they cut the Midland lead all the way down to five at 69-64 in the next three minutes. Midland scored the next seven to go up a dozen and it looked like the Saints might just be out of gas, but they weren’t. Seward kept fighting, taking advantage of consecutive Midland technical fouls to get back to within seven with four free throws from Mathieu and five after Beauregard finishes at the bucket to make it an 80-75 game with 8:59 left. James Byrd found Mitchell Packard sneaking in the back door of the Midland defense to make it a three point game and back to back Niem Stevenson three pointers made it a one point game, 88-87 with just over two minutes left in the game. The Saints then picked the wrong time to go cold on offense as they turned it over with an offensive foul on their next possession and then had three looks from three different players on their next trip down the court and couldn’t finish to leave it an 88-87 game with just 30 seconds remaining. The teams traded free throws to 90-89 and the Chaps made one of two their next time down the floor to make it a two point game with 13 seconds left. With the game on the line, the Saints flew up the floor and got a good look for three in the corner, but it didn’t fall and that was it as Midland iced the game at the line with two free throws to escape the Greenhouse with a 93-89 victory. The Saints had no answer for the multifaceted Midland attack as the Chaps finished the night shooting 53% from the floor. Seward hit on 40% of their shots in the loss and could never get it going from the outside, shooting just 26% from three. In the losing effort, Stevenson put together another big night for the Saints, scoring a game high 27 points while also coming up with a team best eight rebounds. Mathieu scored 17 for Seward and was a perfect 12 for 12 from the free throw line while Beauregard had 16 on 6 of 12 shooting. The Saints drop their first game of the year, falling to 8-1 overall while Midland remains hot with the win as they improve to 8-1. Seward’s stretch of worthy opponents will continue in their next outing on Friday in the Perryman Center in Garden City as they take on 7-1 Missouri State-West Plains.